“We were lucky that it was a clear day and dry – although very cold, especially along some of the windier streets. We left by the rear of John Lewis, which had beautiful strings of white lights from the fifth floor hanging alongside the escalators, and crossed Henrietta Place then Cavendish Square and left on to Wigmore Street where we passed Wigmore Hall. Then into St Christopher’s Place and Gee Court which had wonderful lights strung high above along the road before crossing Oxford Street where the bare trees looked lovely with their fairy lights and into South Molton Street. Here the lights were huge blue and white arches with stars all along the road – very striking. At Brook St we passed the entrance to Haunch of Venison Yard, Handel House museum and Jimi Hendrix house. Then we headed along Lancashire Court (formerly Horse Shoe Yard) decorated with very large bells, to New Bond St, and joined Maddox St. New Bond St was decorated with lovely white Peacock feather lights. At Brown’s dining rooms Roslyn told us it was originally a tailor’s and some of the original décor remains inside. We looked at St George’s Church Hanover Square, where a choir was rehearsing before heading back along Maddox St before crossing Regent St which was decorated with flying angels. 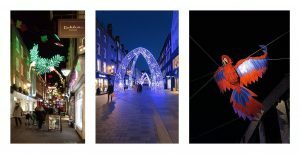 A quick look at the Christmas windows in Liberty then down Kingly St and Ganton St, strung with multicoloured bulbs, into Carnaby St, Newburgh St and Foubert’s Place decorated with a tropical theme – palm trees, parrots, party poppers and oversized lightbulbs. We passed Wright Bros Oyster House and The Bag o’ Nails nightclub. Then we were back at Regent St with the angels – and pretend soldiers outside Penhaligon’s. We headed along Regent St to Vigo St, where Pickett (leather goods shop) had lovely trees lit up over the doorway, past Savile Row and into Burlington Gardens towards Old Bond St. cut through the lovely Burlington Arcade where the decorations were beautiful trees with subtle green lights and out into Piccadilly. Looking along Old Bond St we saw the huge diamond light near De Beers. In Albemarle St there was a simple but lovely theme of white lights across the road. Looking across to the beautifully decorated Ritz we were now getting quite cold and tired, so set off for home after a wonderful walk seeing some beautifully lit streets … ” – Lesley Ramm. 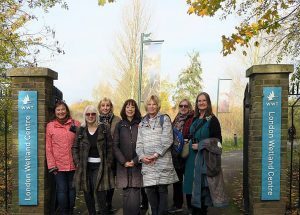 “… a large group of us visited Walthamstow Wetlands today. Some met up at Costa Finsbury Park and travelled together to meet others there. We went into the visitor centre/shop/café area in The Engine House. I bought a map – which thankfully Julie Vaggers could read. We set off in improving weather along the top of the East Warwick Reservoir. It was blustery and chilly until we went down to the path again. We returned to the café between eastern reservoirs and saw more birds and several anglers. Most of us had lunch at the café. Having sat outside some of us soon got chilly. We then went up to the second floor to look south over the reservoirs towards the very prominent church spire of St Mary Stoke Newington (identified by Julie from Google maps). Roslyn and a few others the set off for the northern reservoirs on the other side of Forest Road. We all enjoyed a great day out thanks to Roslyn. – Lesley Ramm. Successful and heartwarming … Members of the Group visited this handsome (and accessible!) 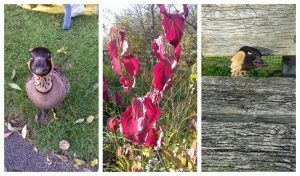 National Trust property wearing its lovely autumn colours. One of the last surviving country estates in London, it was once described by art historian Horace Walpole as ‘the palace of palaces’, Osterley was created in the late 18th century by architect and designer Robert Adam for the Child family to entertain and impress their friends and clients. 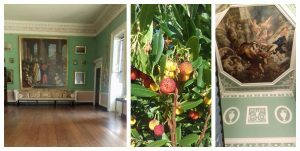 “Fabulous visit to Osterley Park and House with the Outings Group on 27th October wonderfully arranged by Roslyn Byfield. We all thoroughly enjoyed the visit, in lovely weather, and much appreciated Roslyn’s efforts on our behalf. Not only was travel free with 60+ Oystercards and Freedom Passes but entry was free with an Art Fund card too! Looking forward to more outings with a lovely group.” – Lesley Ramm.